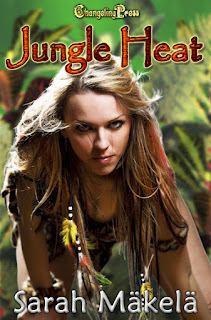 Sarah Mäkelä: Jungle Heat, Now Available at All Romance eBooks! Hey everyone! I have some awesome news to share. Jungle Heat is now available at All Romance eBooks. Also, as I mentioned before there's a sale going on at ARe on Changeling Press books, except I have a correction to make... All Changeling Press titles are 25% off until October 3rd! Woohoo! What's extra cool about that, is when ARe mentioned the sale in their newsletter, they posted Techno Crazed's cover as one of three Changeling Press titles. Squeee!